What is the “lost light” in this unusual Hubble Deep Sky image? The image looks really strange, what is going on? Is there a technical article associated with this work? Let me see if I can explain the main aim and accomplishment of this work. First off: the picture you're puzzling over is a "luminance RGB" image, in which the bright regions are represented by color (a sort of pseudo-true color using near-infrared images), with the second faintest parts represented with black and the very faintest parts with white. The latter aren't qite "garbage", as Hobbes suggests in their answer, but they are relatively speaking the noisiest parts of the image, so there's little real information be found there. This paper (Borlaff et al. ; see the link in Hobbes's answer) is about re-processing near-infrared HST images originally taken about ten years ago as part of the Ultra Deep Field. Previous processing of these images (e.g., Koekemoer et al. 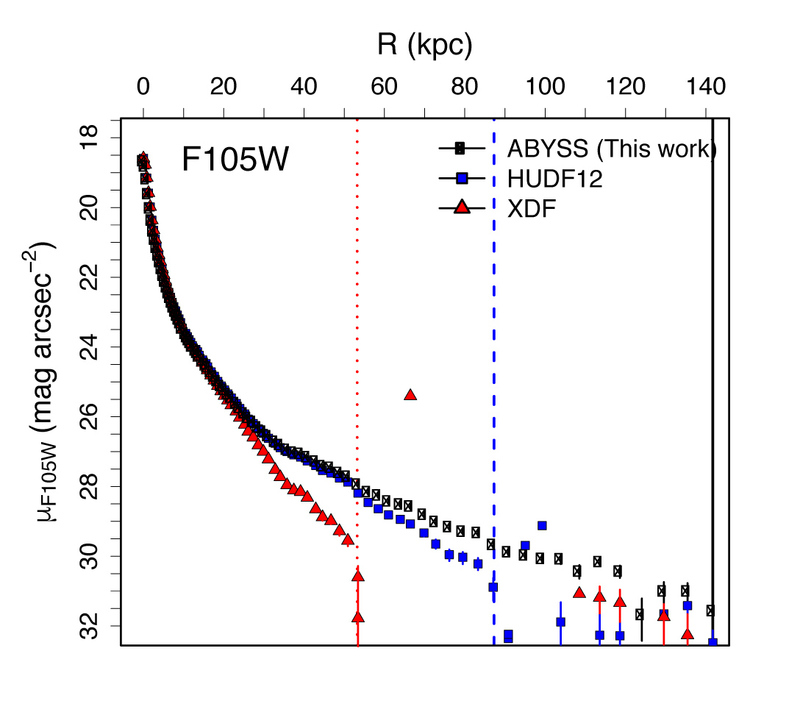 2013 ["HUDF12"] and Illingworth et al. 2013 ["XDF"]) was focused on getting information about the smallest, faintest galaxies, which are mostly the really distant, high-redshift galaxies. Because of this, the crucial stage of sky subtraction had some biases: in particular, it tended to treat the faint outer regions of the large, nearer galaxies as part of the sky to be subtracted. This is actually fine for the analysis of the small, distant galaxies, but means that if you do want to analyze the outer regions (outer disks, faint stellar halos, remnants of merger structures, etc.) of the larger, closer galaxies, you have the problem that their outer regions are over-subtracted (hence the "missing light") and thus unmeasurable. The abstract mentions four improvements the new study implemented when they re-processed the HST images: "1) creation of new absolute sky flat fields, 2) extended persistence models, 3) dedicated sky background subtraction and 4) robust co-adding." I would suggest that the third item is perhaps the most important: they implement a method which does not subtract off the faint outer regions of the larger galaxies, and thus the resulting images still have information about the outer parts of these galaxies. The plot below (extracted from Figure 20 of the paper) illustrates the kind of improvement they were after. It shows the surface brightness (in the F105W near-infrared filter) of one of the largest galaxies (a giant elliptical -- I think it's the big, round, yellow galaxy in the lower middle of the color image) as a function of radius (measured in elliptical annuli). The red triangles were measured using the XDF-processed image, the blue squares used the HUDF12-processed image, and the black points use the newly re-processed image produced as part of this paper [ABYSS]. You can see that the XDF points drop off at a radius of about 55 kpc, the HUDF12 points fall off at around 90 kpc -- but the light from this galaxy can be traced out to 140 kpc in the ABYSS-reprocessed image. This also means you can potentially analyze structure in the outer part of the galaxy out to ~ 150 kpc, which wouldn't be possible with the previous versions of the image. When you plug the lead researcher's name into Arxiv, the first search result is The missing light of the Hubble Ultra Deep Field. Creation of sky flat fields for the four filters. This process is fully described in Sect. 2.4. 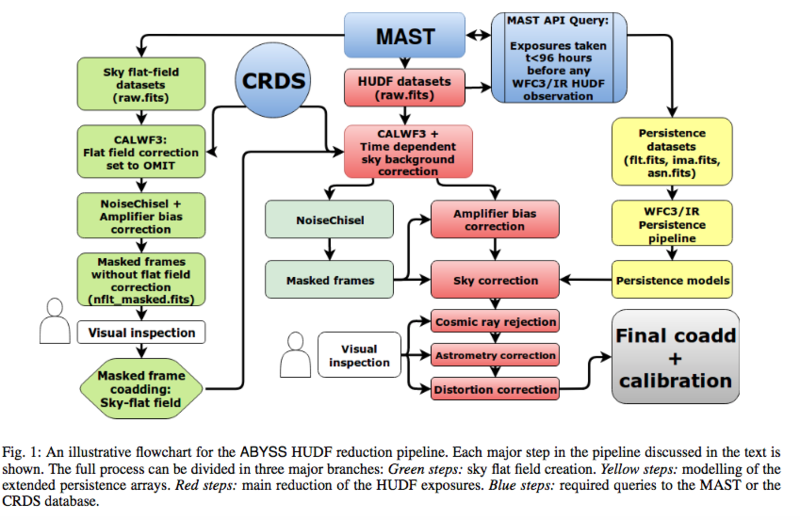 – Creation of a catalogue of all WFC3/IR datasets that may affect our mosaics (including calibration exposures) to generate a set of improved persistence models for each exposure of the HUDF. We detail this process in Sect. 2.5. – Download and reduction of all the WFC3/IR datasets that include observations using the F105W, F125W, F140W and F160W filters on the HUDF. In order to measure the relative sensitivity of the pixels of a detector (flat field), the optimal process would be to observe a uniform external source of light. Basically they're trying to remove all sources of noise from the image, in an attempt to make faint signals appear in places where that signal has been overwhelmed by noise. A known effect that affects HgCdTe IR array detectors (as is the case of the WFC3/IR) is persistence. Persistence shows up as an afterglow on the pixels that were exposed to a bright source of light in a previous exposure. The current method of persistence correction of WFC3/IR con- sists in modeling the number of electrons that would be created by persistence in each pixel by all the previous exposures (up to a certain time) that were taken before the one to correct (Long et al. 2012). During long exposures, sky background can vary noticeably, introducing a non-linear component to the count rates calculated by calwf3. We individually estimate and subtract the sky background emission from each readout of the intermediate ima.fits files. In order to avoid systematic biases due to the presence of de- fects in some regions of the detector, we created a manual data quality mask to flag those regions were the flat field cannot fully correct the differences in sensitivity. In this Section we describe the methods used to remove the sky background from the individual exposures and the final mosaics of the HUDF. As a consequence, when comparing images from different visits, it is usual to see that they are not exactly aligned. In order to exploit the full resolving capabilities of WFC3, we need to carefully re-align the images of different visits to a single reference world coordinate system solution (WCS hereafter). and as a final step, image combination. 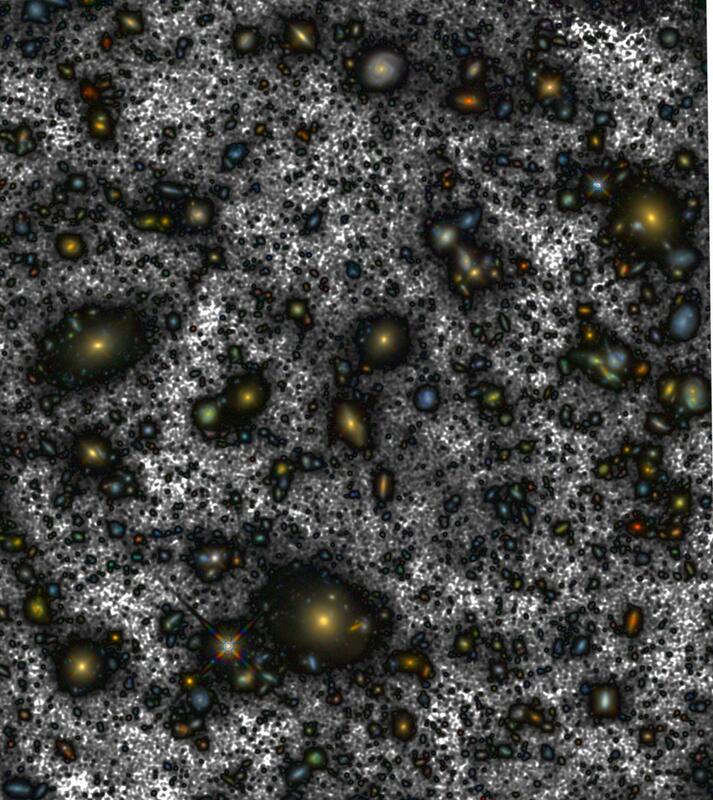 The XDF version of the HUDF WFC3/IR mosaics is dominated by a systematic bias in the form of a significant oversubtraction of the sky background around the objects with large angular size. A similar result (to a lesser extent) is obtained for the HUDF12. We successfully recover a significant amount of over-subtracted diffuse light around the largest objects of the HUDF, not detected by the previous versions of the mosaics. They've processed the images to bring out details in the galaxies. In the space between the galaxies, the image processing gives garbage results (the white areas), but they've managed to bring out detail on the edge of the galaxies that was hidden before. To reduce noise effects, the team did flat-fielding adjustment and then summed multiple exposures, thus allowing weak signals to add while noise effects cancelled out. That's the TL;DR which leaves out a lot of really cool methods of identifying "true dark" and noise patches vs. reliable signals (stars or galaxies or whatever). Not the answer you're looking for? Browse other questions tagged data-analysis hubble-telescope deep-sky-observing image-processing or ask your own question. What are the dark spots in this Hubble image of the Crab Nebula? What are the large round dark “holes” in this NASA Hubble image of the Crab Nebula? Is this image captured by the Hubble Telescope an original image? How close to Earth were the asteroids moving through this Hubble composite image? Is gravitational lensing a good way to search for negative mass?